A quick Google search will yield plenty of handy autocomplete plugins — there’s even an option shared by jQuery UI which comes bundled with the library. However today I want to look into an alternative solution. The jQuery Autocomplete plugin released by DevBridge has the exact functionality that I find most appealing. The resources are not too difficult to get setup. And similarly all of the HTML is very straightforward so you can implement any type of search design in your page and it should work fine. I am using an outer container with the ID #searchfield to center the whole form. There is no submit button for this demonstration, however the results will appear automatically in the dynamic context field below the input. We can target the field by using an ID of #autocomplete. There is no extra HTML because all of the suggestions will be presented using JS codes. One other interesting area is the paragraph using an ID of #outputcontent. This is where we can display the user’s choice once they click on a suggestion. Normally on a live website you would instead just redirect the user to a search page, or onto the main page itself. I do not want to delve too far into detail, but we should look at the CSS styles for each of the suggestion features, along with the main input area. The outer box border and content styles are heavily developed around the Design Shack search bar. Each of the suggestion styles is based off the default code, which I have copied over into my stylesheet. If you want to keep these in a separate stylesheet it would still load just fine. However I try to combine resources so that we may cut back on HTTP requests from the browser. The first two classes are targeting the entire suggestions popup, along with each internal suggestion row. You may style them in any way that fits your website. Additionally the CSS comes along with a selected feature class to highlight text which has already been typed by the user. The search field itself should not be a problem regardless of your own design. 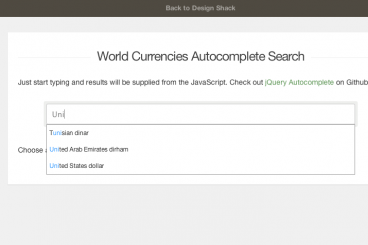 jQuery Autocomplete is built to work around any width so that all suggestions can fit nicely into the same layout. Granted my example does take up a lot of space on the page, but the plugin handles this flawlessly without very many customizations. If you are using a backend Ajax call to fetch data results then you may have to perform your own search feature. jQuery Autocomplete expects some type of response data like XML/JSON and this should be returned from PHP, Rails, Python, ASP.NET, etc. So the most likely scenario is to search through your database table of entries and pull out all the related posts and their URLs, then return this list to your browser. All of this content must be added before running your own function within jQuery. I have chosen to keep the array and custom function call stored within the same JS file. However you can choose to separate functions from data and move them into different files altogether. Now the autocomplete plugin only requires a small amount of default code. I will copy a sample template along with my live demo code so you can see what I’ve done using the same parameters. The lookup parameter is only used for local data when we are targeting an array. onSelect will trigger a new function every time the user selects a suggestion. In my live demo we simply create a new string of HTML to output the selected name and value of that entry. But please notice that my demo is a very bare-bones example of what is possible. If you have never toyed around using autocomplete suggestions then I must recommend this plugin. I have used a few different solutions in the past but nothing has really stood out to me until now. And there is a big difference between loading suggestions with page results v. search results (like Google Instant). Before using this plugin, make sure you have a good plan for constructing a user interface that works nicely. The jQuery Autocomplete plugin along with all my source codes are released for free under the MIT license so you are open to use this for any project!